"Who would have thought that I would become the worst maniac of all?" Dale Brown holds a bicycle he built for his son, Ryan. Nation Bicycle Dealers Assn. board of directors. Chief Judge: North American Handmade Bicycle Show. He knows what bicycles want, and he gives it to them. GREENSBORO -- Ask anyone on two wheels if Dale Brown is the type of person who should own and run cycles de ORO, Greensboro's landmark bicycle shop, and they'll tell you it couldn't possibly be any other way. "He was born to run a bicycle store," Walter Triplette said. Triplette, owner of Triplette Competitive Arms in Elkin, once owned a bike store in Durham, NCand has known Brown many years. "He is one of the very few people that you meet that not only loves the sport and the experience of bicycling, but also has enough brains to run a business properly and efficiently," Triplette said. "Further, he has mechanical ability and understanding and the hand skills necessary to be not just a functional mechanic but a superb mechanic. Bicycle mechanics refer to it as having the `Zen,' and he does. He understands how the bicycle wants to be fixed, and he can do it." Brown has been doing `it' for years, much of that time as owner of cycles de ORO, a retail bike store near Wendover Avenue and Battleground Avenue. The store's name means `cycles of gold,' and the name is appropriate. He sells only the best. Business is good. Last year's sales were great, and the future promises to be even better, according to Brown. During peak periods, he employs 15 people. His shop is loaded with road bikes, mountain bikes and -- for those that want a little of each -- hybrids. The bicycle industry is big business, about $5.3 billion in retail sales nationwide, including parts and accessories. That figure is up from $3.6 billion in 1990. Bikes today are available with frames in a variety of space-age materials, including titanium and carbon fiber. For bike-racing enthusiasts, the lighter a bike is, the better. And they are willing to pay a pretty penny. Finding a $2,000 road bike at Brown's shop isn't unusual -- and some customers wouldn't be caught dead on one that cheap. For the really discriminating or hard-to-fit cyclist, Brown builds bikes to individual specifications. After taking several key measurements of the rider, he brazes the tubular steel frame together and then assembles the bike. The result is a precision piece of equipment tailored to that rider. Debbie McDaniel is waiting for Brown to complete her road bike. McDaniel, who described herself as having short legs and a long torso, needs the bike for a group ride she will lead this summer at Lake Tahoe, Nev., to money for the Leukemia Society of America. "I mostly chose him because of his background and how many bikes he has built for other people and how pleased they have been," said McDaniel, creative director of Builders Art & Graphics Inc. in Winston-Salem. "And being a female, it is difficult to find a bike to fit a female frame." Brown wasn't born on a bike, but he developed an appreciation for human propulsion early in his upbringing. His hometown was Yorktown, Va., and his father was a scientist who was assistant director of NASA's Langley Research Center. "I saw a lot of the behind-the-scenes stuff," Brown said. "I got to meet Wally Schirra and Virgil Grissom and all the early astronauts." Technology and engineering surrounded Brown during those years. But he also was exposed to creative thinking and expression through his mother, who was an artist. Both influences became evident later in his life in his creation of ornately designed bicycles. But as a teen, he was still searching for an interest. When he graduated from high school and enrolled at the University of Virginia, he settled on a liberal arts curriculum, after considering a career in law. Brown was in college two years, but then joined the U.S. Navy. He spent two years stationed in Vietnam on board the USS Okinawa, a ship that transported helicopters for Marine landing parties. He finished his military stint in San Diego and returned to the University of Virginia to complete his bachelor's degree in fine arts. He bought a bike to get to his classes -- a three-speed Sears bike -- and was amused when his younger brother tried to outdo him by buying a 10-speed bike. "I scoffed at his extravagant 10-speed," Brown said. "Who would have thought that soon I would become the worst maniac of all?" No bike clique in those days! He was accepted to the University of North Carolina at Greensboro's master of fine arts program and became a teaching assistant. But the bike demon was weaving its way into Brown's mind. He started spending as much time studying his bike as riding it. "I took my father's frame of mind and started looking at the technical aspects," he said. "The bicycle is the American male dream, in the sense that it has got every possible nuance of gadgetry and refinements that have gone back over a hundred years." He bought his first 10-speed -- a lightweight Raleigh racing bike for $250. It was his first refined bicycle, and he studied every piece of it. "Typical of my modus operandi, I promptly got every book and magazine I could," he said. "I didn't have any other buddies that rode or peer-group support. There were not many cyclists around, compared to these days. It was a pretty obscure thing -- mostly kiddie stuff." Due to funding cutbacks, Brown lost his teaching assistantship at UNCG. Needing money to continue in school, he started working part time at a string of Triad bike shops. About that time, he and some other cyclists started the Triad Wheelers Bicycle Club, a group that is still active today. Brown also took over the management of the Carolina Cup, a daylong series of bike races at Country Park in Greensboro, which he still runs. The annual event, which celebrated its 25th year last fall, is the longest running bike race in the Southeast and attracts nationally ranked professional riders. 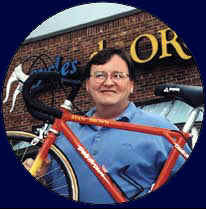 Brown became partners with Robert Kraus, who had started the Toga Bike Shop in Greensboro. Kraus's brother owned the original Toga in New York. Kraus handled the books, while Brown did sales, promotions, parts buying and repairs. Toga was one of the the first representatives of a custom-bike line made by McLean Fonvielle, an artist and bike maker from Silk Hope, N.C., who died in 1983, just as he was establishing a name. Brown learned many of his frame-brazing skills and appreciation for bicycle workmanship from Fonvielle and decided then to concentrate on the sale of premium bikes, relinquishing the lower-price lines to mass merchandisers and other shops. Brown also started to make ornate custom bikes. "Dale was always exploring the new, the different, the far-out," Kraus said. "When we would go to bicycle shows in New York, he would always bring back the rarest, weirdest-looking bike he could find." They started a racing team that competed up and down the East Coast, traveling in an old VW bus. "Dale is a likable, outgoing fellow, and he makes a very good salesperson," Kraus said. "I've never met a person who is so completely absorbed in the topic of bicycles. He would go home and spend his entire evening reading magazines cover to cover." They changed the name to cycles de ORO in late 1983. Kraus decided to go back to college, and he sold his interest in the shop to Brown. They are still good friends. Promotion is part of Brown's nature -- for himself, his shop and for cycling. He constantly sponsors races and group rides and each year fields a bike team to raise money for the Special Olympics. Two week ago, he sponsored "Cirque du Cyclisme," an event consisting of a group ride, a display of classic bikes and a bike-parts swap meet. "The appeal of the bicycle is that it is a crude machine that has bridged an incredible amount of time but is still basically the same machine that was made in the 1880s," Brown said. "It's anachronistic in that an average person with minimal hand tools can still totally maintain it. What other machine in our lives is like that?"